A day of unmremitting feathery drizzle and cloud, which was just as well, as there's little scenic interest between Oswestry and Stafford. 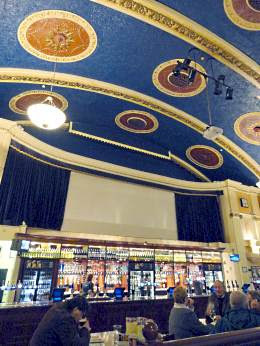 In fact, the only thing of note above my head all day has been the magnificent vaulted art-nouveau ceiling of Stafford Wetherspoons, an old picture house (above). The chief points of interest today were toponymic. 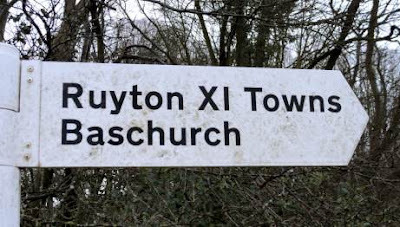 I went through Ruyton-XI-Towns, surely the only place in Britain with a capital X in its name (above). I went in to the local shop to see if they sold xylophones or xerox machines or x-ray specs. They didn't. They had some homemade chutneys, though. However, the village store in the previous village, Knockin, had the inevitable name The Knockin Shop. There's a Sustrans path from Gnosall to Stafford (NCN 55) along an old railway line which is gnot very gnice at all: too gnobbly, and full of gniggly puddles. 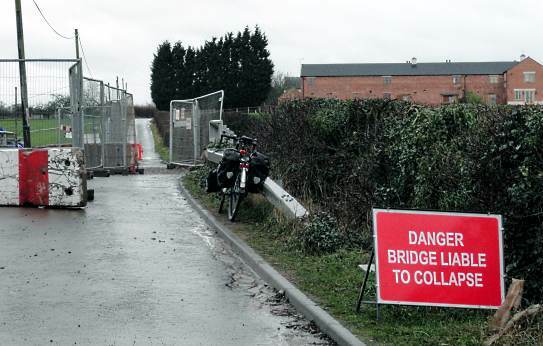 En route - through some rather handsome Shropshire villages, such as Grinshill - I went across this 'closed' bridge (above). Despite some determined jumping up and down, the bridge did not collapse. Ah Stafford - one thrill after another... Trust you to find the nearest Wetherspoons though. Well, you'll fly along tomorrow with a 30mph westerly. Just don't try and stop. You will be jealous . . . Sue and I plan to cycle to the Lawnmower Museum tomorrow.